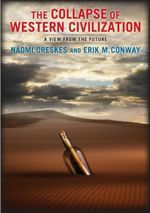 Science historians Naomi Oreskes and Erik Conway, co-authors of the acclaimed Merchants of Doubt, have joined forces again to produce a striking short fictional work The Collapse Of Western Civilization: A view From The Future. It purports to be an essay written by a Chinese historian three hundred years after the collapse of western civilisation towards the end of the 21st century when untrammelled climate change took its full effect. The period of the Penumbra (1988-2093) ended in the Great Collapse and Mass Migration (2073-2093). That’s the scope of our Chinese historian’s survey. He (or she)records the dawning scientific realisation of the effects human activities were having on the planetary climate, the setting up of the Intergovernmental Panel on Climate Change and the first manifestations of the change in the intensification of fires, floods, hurricanes, and heat waves. Thus far he writes of matters familiar to us. He then moves on to recount the rapidly mounting disasters as the century proceeds. It’s somewhat unnerving to read of what we know as predictions as if they had already become the stuff of history. All the more unsettling because anyone who follows climate science will recognise that the chain of disaster he traces, from failing food crops in intense heat waves to unmanageable sea level rise as the West Antarctic and Greenland ice sheets begin to disintegrate is entirely possible if greenhouse gases continue to be pumped into the atmosphere by human activity. The resultant human suffering and death the historian records may be more speculative from our end, but his calm account of the human consequences has a dismaying ring of likelihood to it. Aafter a busy month of harvesting (Gareth) and breakfast broadcasting (Glenn), the Climate Show returns with all the latest climate news: from the thinning of Antarctic ice shelves and the intensification of hydrological cycle (floods and drought, that is) to satellites capturing solar energy and beaming it down to earth, we’ve got it all. And if that weren’t enough, John Cook looks at a new paper that explains the apparent lag between warming and CO2 increase at the end of the last ice age, and tips us off about an excellent outtake from ABC’s recent I Can Change Your Mind about Climate documentary, featuring Naomi Oreskes. Watch The Climate Show on our Youtube channel, subscribe to the podcast via iTunes, listen to us via Stitcher on your smartphone or listen direct/download from the link below the fold. Follow The Climate Show at The Climate Show web site, and on Facebook and Twitter. John Cook’s website Skeptical Science is held in high regard for its patient examination of the arguments put up by climate change deniers and its marshalling of the answers mainstream climate science provides. The result is quietly devastating as the scientific inadequacy of the deniers’ arguments becomes apparent. Cook has now collaborated with environmental scientist Haydn Washington in a book which puts denial in all its forms under the spotlight of reason and challenges readers to recognise it for the delusion it is. Climate Change Denial: Heads in the Sand not only focuses on the deniers who claim that the science is wrong but also, as the subtitle indicates, conducts a telling examination of the full range of societal denial. Some denial is active and aggressive, but the persistent refusal of society to adequately face up to the reality of climate change is also a form of denial, one which the book addresses with urgency. There’s a great line-up of speakers and participants: scientists David Karoly, Martin Manning and Dave Frame, science writers Fred Pearce and Erik Conway (Naomi Oreskes’ co-author on Merchants of Doubt) and many others. I’m taking part in a “cafÃ©” session on the Thursday evening (giving a short 8 minute talk) and then on Friday evening joining Pearce and Conway on stage at the Soundings Theatre in the museum at 6-30pm to discuss climate communication (Sean Plunket in the chair, tickets are free). I’ll be trying to grab a few interviews for future Climate Shows, but most of all I’ll be listening and learning (and perhaps tweeting/blogging a bit, if I have time). Promises to be a fascinating few days, even if I don’t go to see the colossal squid. Just in from the RSNZ newsletter: Professor Martin Manning, Founding Director, NZ Climate Change Research Institute, invites members of the public to attend two events which are part of the climate change forum on 31 March and 1 April. CafÃ© session (free) â€“ What can we do as individuals? â€“ panel hosted by Ian Wedde with Gareth Renowden, Sir Lloyd Geering, Professor Bob Gifford and Dr Bronwyn Hayward. 31 March, 6.30 – 8.00pm, Te Papa. Breakfast session (free) â€“ Responding to big risks â€“ panel hosted by Chris Laidlaw with Martin Kreft, Fred Pearce, Colin James and Professor David Karoly. 1 April, 7.00am – 8.30am, Te Papa. For more information, and to register for the forum and these events, visit www.confer.co.nz/climate_futures – email Liz Thomas, or phone 04 463 5507. Follow The Climate Show on Facebook and Twitter, and soon at The Climate Show web site. Show notes below the fold. Bad Behavior has blocked 3203 access attempts in the last 7 days.